At least two locations in Jerusalem claim to be the Upper Room: the place where Jesus shared his last supper with his disciples, and where the gift of the Eucharist was first shared. One of those locations is called the Cenacle. It is the better known of the two, outside the ancient city wall, on Mount Zion. The other is to be found in the Armenian Quarter of the Old City, where one of the winding, walled streets makes a dogleg of a turn, not too far from the Church of the Holy Sepulcher. A sign announces that you are approaching Saint Mark’s Convent. Passing through the entrance and the outer courtyard, you go through another set of doors into a small, ornate church, at the back of which is a narrow staircase that leads to the Upper Room. Except the stairs here don’t lead up; they go down. Everything in Jerusalem is built on the ruins of something older. The old Syriac church of Saint Mark is built on the ruins of an older church, an older structure that was destroyed at least once, about 70 AD in the Roman sack of Jerusalem. Older versions of Jerusalem lie buried beneath the current version – which looks plenty old to me – and so a faithful visitor must now go down a set of stairs to enter the Upper Room. There is a certain cognitive dissonance to this experience that is hard to escape. It’s not just that there is almost nothing about the windowless, plain room that suggests it is a holy place; that there are almost no signs and little feeling of sanctity to the place; that the modern electric lights - Home Depot-style, faux-crystal fixtures that are wired to the ceiling - rob the space of any ambiance. There is something wrong with the idea of walking downstairs to get to the Upper Room. You simply feel that you cannot be going to the same place that Jesus and his disciples went. It feels more like you are entering a kind of M.C.Escher drawing, in which stairs that seem to lead down actually lead up. But this cannot be. All of which leads me to wonder about the Upper Room of tonight’s gospel. Not just about the precise location of it in Jerusalem, but about what took place there, about the gift that we are told was given, the commandment that was delivered, the example that was made, the lesson we are meant to learn from tonight’s gospel. 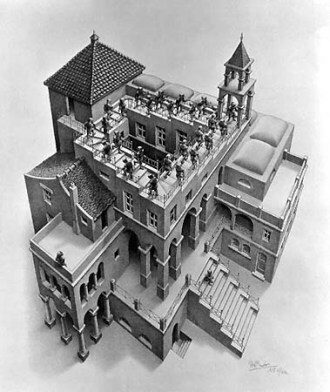 Having once walked down a set of stairs to reach the Upper Room, I find myself wondering if the Upper Room is an impossible object? Are the lessons this gospel seeks to teach us impossible objects? And if they are, would that mean that the bread and the wine – those crucial gifts of tonight’s celebration – are also impossible objects? Or more precisely: the Body and Blood of Jesus that Christians have believed for two millennia are hidden beneath the forms of bread and wine – are these impossible objects that we have allowed ourselves to perceive in such a way that they could not actually exist? And do we cling to the initial impression of what these elements are, even after that impression has been contradicted by a vast array of evidence in the world? To put it another way: Is the church’s teaching about tonight – that Jesus gave us the gift of his Real Presence in the bread and the wine of the Last Supper, and that when we pray the prayers, and say the words, and believe with our hearts the things we must pray and say and believe, then he is really, truly among us – is all this just a staircase leading downstairs into a supposedly Upper Room? A story, whose cognitive dissonance can only be resolved with a willful ignorance, sometimes called faith? To much of the world, this is how what we do tonight, and every day of the year here at Saint Mark’, looks: like a bunch of people who have been duped into believing that you can walk downstairs to get to the Upper Room; that an Impossible Object is actually the Real Thing. But what we must remember about tonight is this: that tonight’s Eucharist has been built on the ruins of older Eucharists. One Mass is built on the bricks of many masses that came before it, even if those bricks were left only for rubble before. How do we determine whether or not the bread we take and bless and break and share tonight is really Jesus’ Body? How do we determine if the wine is really his Blood? We may have to excavate this Eucharist, to dig down to the layers deep below: the older Eucharists this one was built on – which is exactly what the church is inviting us to do tonight. We dig down past 163 years’ worth of masses right here on this spot, celebrated by my thirteen predecessors, and the men and women who worked with them. Then we dig down past the colonial Holy Communions, that were probably kept on Christmases and Easters in this city, but not much more than that. Because this is a holy archaeology, we don’t have to sail the seas to find the fossil record of the masses that prayed for the ends of wars and the well-being of the men and women who fought them. If we are lucky we will discover the evidence of the masses (though not enough of them) that prayed for the safety of Jews who were being slaughtered in Poland; of masses that beatified Nicholas and Alexandra, that were terrified by the tricoleur, that gave thanks for Columbus’ return, that damned the onslaught of the Moors, that rejoiced at Fra Angelico’s painting, that set the Inquisitor’s imagination aflame, that prompted Francis to stand naked in the square, that crowned Charlemagne, that rang out in the chants of monastic chapels, that fled persecutions, that huddled nervously behind closed doors or in catacombs, that strained to remember what it was exactly Jesus had said, before it was written down. And, of course, deep beneath the stratified, sometimes ossified layers of all these masses, we get to the wide, wooden boards of a floor in an Upper Room, where the Twelve are reclining around a table with the Rabbi. It is dim here, so many layers beneath the Mass we began tonight, but there is enough light to see by, and enough quiet to hear by, and to remember what this first Communion was all about: when the Son of the living God, who had been since the world began, came down to this Upper Room, and although he had the power of God, took on himself instead the girdle of service and washed the feet of those he’d called to serve him and his mission. Down here we can still hear the echo of his ancient words, “This is my Body. This is my Blood.” We have had to dig down deep to get to this Upper Room, but we can feel the power of his question reverberating in the dirt and stone around us: “Do you know what I have done to you?” Do you know? What he has done is given us these Impossible Objects of his Body and his Blood. They appear to us with so many dimensions: they remind us of the way he cradled his disciples’ feet in his hands as he washed the dust and the dirt from them. They bear to us the words of his only commandment: that we love one another just as he loved his disciples. This scant half-ounce of dry wafer and less than a half-ounce of wine transmit the truth of God’s love: the force that called light from darkness; the covenant that freed a people from their captivity and led them to a promised land; the wisdom and the strength of Solomon; the power that healed the sick, made the lame to walk and the blind to see; the voice of the prophets; the mercy that comforted the imprisoned and those who mourn; the hope that seemed to be buried with Lazarus; the beauty that glowed beneath Magdalene’s curls; the patience and strength of a Cyrenean’s shoulder; the faith of an impetuous fisherman; and the life that seemed to die on the Cross, but that was really gathering strength. All this in a speck of bread and a drop of wine! These are Impossible Objects! They appear to be barely more than 2-dimensional, and we quickly realize that they cannot possibly exist in the way we say they do in real time and real space. The bread and the wine have not changed; I have no power to turn them into something they are not. Quickly our minds perceive the contradiction here, and yet somehow the initial impression remains. Tonight, we are gathered together to remember that an older version of this sacred meal lies beneath the current version (which looks plenty old to so many people). And that these days, yes, you must go down a set of stairs to reach the Upper Room. Tonight, we rejoice in that little staircase that leads downstairs to Upper Room. We delight in the impossibility of such an object as a staircase that could ever lead us to that holy place, that holy time, that holy company, that holy communion. And, more specifically, tonight we rejoice in the Impossible Objects of Christ’s Body and Blood – barely more that 2-dimensional on the altar, it seems; practically less than 2-dimensional to so much of the world that has given up on them. These are Impossible Objects: this Body, this Blood. They cannot possibly be what we say that they are, and when we look closely at them, we see the contradiction, for indeed, they appear to all the world to be nothing more than bread, nothing more than wine. And yet… the initial impression remains even it after it has been contradicted. And it does so because of the complicated and beautiful sedimentary layers of all the Eucharists this present one is built upon. Because since that first Eucharist all those centuries ago, men and women have held out their hands, opened their mouths, and been fed. Tonight we have walked toward this ancient staircase that we are told leads to an Upper Room, even though any idiot can see that it leads down, where it can only get dark, and where we are sure to encounter no one but the dead. But we go downstairs in faith; we taste, and see: we arise, and we live! Posted on April 5, 2012 by Sean Mullen.